In North Sinai, the first thing people do when they wake up is check their cell phones to make sure that their mobile and Internet connections are still working. Unfortunately they are disappointed almost everyday. This is the reality that we have grown accustomed to since last September, after military operations began in North Sinai. Nearly every day we awake to find the connections disabled. This typically lasts for about 12 hours. The military operations began here in September 2013 as part of the government's war on terrorism, following a series of attacks targeting the army and police in the peninsula. For local civilians, the effects of the assault are many: check points have been established on the main roads linking the cities in North Sinai. Curfews as early as 4pm have been imposed in some areas. The daily disconnections of phone and Internet services have only added suffering to people's lives. Some mobile network users are working to put pressure [ar] on providers to change this trend. Last October, a group in North Sinai decided to sue the operating companies for the repeated disconnection and delays in reestablishing connections. A Facebook event page [ar] invited individuals to join the lawsuit, which chiefly targeted Mobinil for repeated and long-lasting service cuts, but these were in vain. 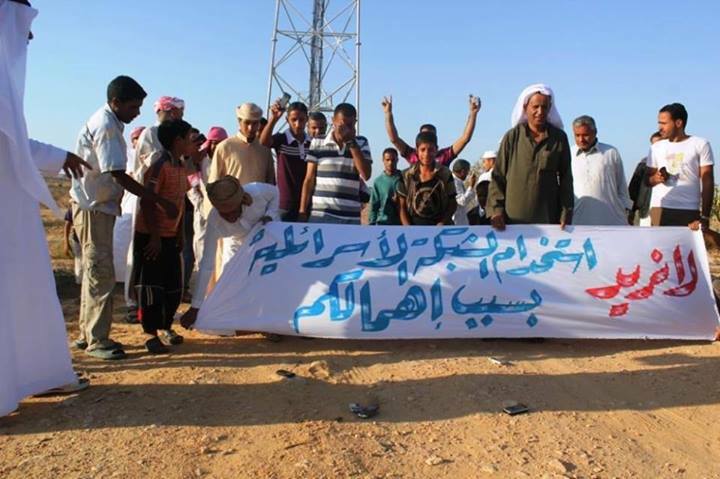 In downtown Arish city, two demonstrations against service cuts were held. One organizer of the first protest (a founding member of 6 April movement in North Sinai) was detained for one day following the event. Some activists from North Sinai launched a hashtag on Facebook and Twitter with the title #Sinai_out_of_coverage (#سيناء_خارج_التغطية) expressing their daily suffering with the networks disconnections, hoping that their voice might be heard and that they will regain their normal life once again. Many teachers travel every day from Arish to Rafah (on Egypt's Eastern borders with Gaza) and Sheikh Zuwaid (Southern Rafah) or to Central Sinai passing by very dangerous roads with IEDs, shootings, and clashes between the army and militants. There have been two recent incidents where a group of teachers riding by bus passed by violent clashes — in both incidents, multiple teachers were shot and some were badly injured. Families constantly worry about their loved ones traveling through these dangerous areas and want to make sure their family members working in those places are safe. But without mobile phone connections, they are unable to do so. Cyber cafe and mobile shop owners also suffer from these service cuts, which leave them with little revenue to keep their businesses afloat. When the networks are working, everyone tries to do all they need using cell phones or the Internet, but even then, the service is so bad that there’s little they can accomplish. People can hardly make a phone call, and both sides are often unable to hear anything. Security officials say that they disable connections because militants use cell phones to communicate and to explode IEDs. This may be true, but these networks are meant to serve the general public. Shutting them down affects everyone. Some even argue that neighboring Israeli and Palestinian networks are so strong that they have coverage in much of North Sinai — when Egyptian networks are cut, militants will simply use these instead. In the end, peaceful civilians are those who suffer most from the everyday routine of disconnection.